Connect to Learning (C2L) is a network in the United States that brings together national ePortfolio practitioners to share resources, and research related to ePortfolios. 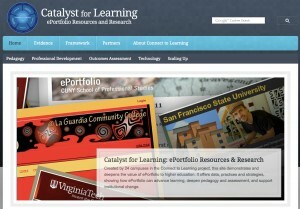 As part of this initiative they have developed a rich ePortfolio resource, Catalyst for Learning. The website includes a framework for ePortfolio design, Inquiry, Reflection and Integration and resources focused on assessment, design and professional development.